30 years since the Hinton train disaster: Are Canada's railways going back in time? 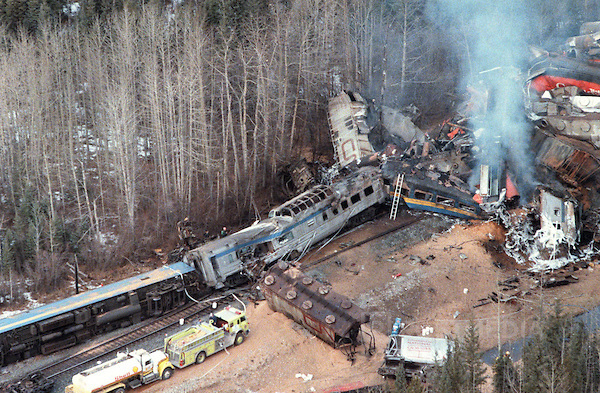 On the morning of February 8, 1986, one of Canada's worst train disasters happened 16 kms east of Hinton, Alberta, which is located between Jasper and Edmonton. A CN freight train travelling at 96 km/h at the time of impact, ran head-on with a VIA Rail passenger train, leaving 23 dead and 95 people injured. It was the most lethal rail disaster in Canada since another head-on collision in September 1947 at Dugald, Manitoba, 23 kms east of Winnipeg that killed 31 people. The Hinton disaster was not surpassed until the Lac-Mégantic, Quebec disaster on July 6, 2013 that killed 47. Commissioner Foisy said that the train crew demonstrated a lack of alertness and was probably experiencing chronic fatigue. He also condemned the Company’s “railroader culture” that ignored safety regulations. That “culture” was deemed by Foisy to be one of “prized loyalty and productivity at the expense of safety”. Safety regulations were beefed up in the aftermath of the crash. Certainly, more emphasis has been placed on safer railway operations since 1986. However, are the railway companies slipping back in time and ignoring the recommendations and regulations that were implemented following the Hinton disaster? Particularly in the area of fatigue? Our Unifor Council 4000/Local 4001 membership who work as Locomotive Engineers and Conductors on the former short line Savage Alberta Railway, owned and operated by CN since December 1, 2006, is supposed to be a scheduled operation based on the working conditions that are enshrined in the collective agreement - hourly paid and scheduled turn-around assignments with assigned rest days. But management has resorted to turning most assignments into spare board positions where everyone is on-call and assigned rest days are shortened or non-existent. And for what scheduled assignments are left, many members don’t know the exact times they will work on scheduled assignments as the schedules are routinely set back. And despite the collective agreement stating that assignments are to work in turn-around service – meaning crews turn-around at the away from home terminal and work back and tie-up at home (no time spent in hotels) – sadly the collective agreement is ignored and crews are at times tied-up away from home in motels, in some cases for many hours. Management appears to refuse to put a proper effort into managing the schedules to ensure that regular assigned assignments are maintained, and that workers can rest properly during non-work hours and enjoy time off on their assigned rest days. Train crews (Locomotive Engineers and Conductors) will all tell you that today’s working environment, particularly at CP, where longer trains, unpredictable schedules and the elimination of taxis and vans used to deadhead replacement crews back and forth between terminals, is forcing workers to spend longer hours stuck at away-from-home terminals. And the railways never want to coordinate or amend schedules to consider fatigue. And if train crews book off work on account of feeling fatigued and unfit to perform their duties with alertness, they face disciplinary measures for booking off. Anticipate work calls, using inaccurate train line-ups, including the omission of trains. The inspector said that the circumstances surrounding these complaints “reduces necessary rest, and creates excessive fatigue” and is occurring at CP locations within British Columbia. Sources familiar with the audit told the Canadian Broadcasting Corporation (CBC), in the news story we posted above, say that CP's fatigue management practices "are not very robust and lack scientific rigor", unlike in the airline industry, which has adopted much stricter, more predictable scheduling for employees. "The rail industry as a whole is not very receptive to this," one government source told CBC News. "They are digging their heels in and sticking their heads in the sand. About 25 per cent of all of CP's train crews have no predictable schedules and are on-call 24/7." Why is Transport Canada hiding information? Transport Canada is the department within the government of Canada that is responsible for developing regulations, policies and services of railway transportation. It is also the department that is to ensure compliance of these rules and services. But they refuse to publicly release details about a range of safety issues detected on Canada's railways. And what information has been released, the documentation has been heavily redacted – blacked out – or kept secret by Transport Canada. Why? Redacting information that is in the interest of public safety, information that the public has the right to know, shows just how much power and influence companies like CP and CN, as well as all of Canada's railway companies and their lobby group, the Railway Association of Canada, have over our transportation regulatory system. These matters were not helped with a pro-big business, right wing Conservative government lead by Prime Minister Stephen Harper from February 6, 2006 to November 4, 2015, whom acted more like a private corporation than an open and transparent democratic government that is elected by Canadians. Let’s hope that the new government will become more transparent and work openly to ensuring the public safety and that of railway workers' safety, not simply the influence of wealthy railroads and their shareholders.